It is my pleasure to present to you the conclusions of the election observation mission carried out by Congress of Local and Regional Authorities last October. You may know that our team, composed of 32 members including five colleagues from the EU Committee of the Regions, was the only international observer delegation on the spot. We were able to assess the vote in more than 250 polling stations. In general, we were satisfied these elections were well organised and took place in a calm and orderly manner, with the exception of a few violent incidents which definitely cast a shadow over the Election Day. – I will talk about this a little later. The written Report and the Recommendation further to our mission has been already approved by the Monitoring Committee of the Congress which met a few days ago in Athens. On March 30th, the Congress’ Plenary Session will discuss this Report and is invited to adopt the Recommendations. Our attendance in Bosnia and Herzegovina during the local elections fits into the institutional framework of responsibilities of the Congress which include election observation at the grassroots’ level. Over the last 15 years, more than hundred such missions were organised in Council of Europe member States and sometimes beyond. Congress’ delegations are composed of elected local or regional representatives like myself – which means that we are observing such elections on a peer-to-peer basis. We are politicians, not technicians, and many of us are involved in grassroots’ elections in our own countries and municipalities. Our observation mission in Bosnia and Herzegovina took place from September 28 to October 3rd 2016. Led by Stewart DICKSON, the Head of our delegation, we had the opportunity of meeting representatives of the Central Election Commission organising this conference together with the colleagues from the Electoral Assistance Division of the Council of Europe. 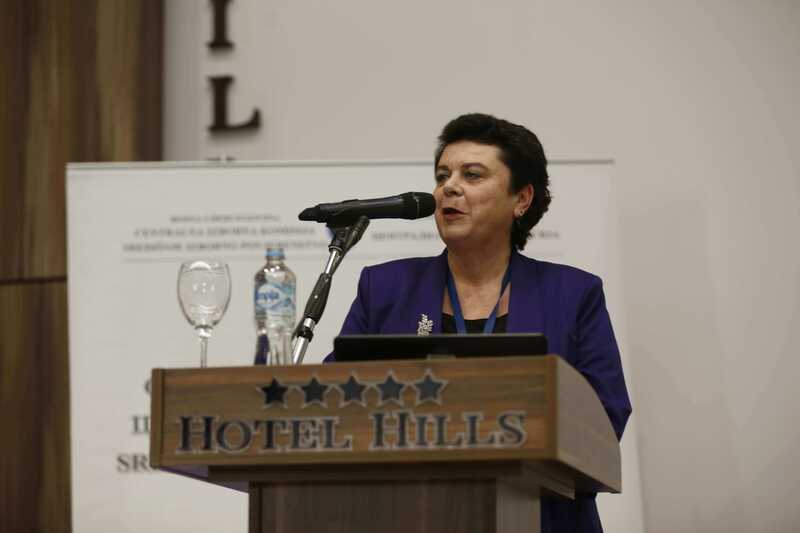 I was happy to see Dr. Hadziabdic again, now in her new function as President of the CEC. We also met with representatives of the media and of parties running in these elections, as well as people from the coalition of non-governmental organisations, Pop Lupom. I want to highlight the active role played by civil society to improve the trust in electoral processes in Bosnia and Herzegovina. The ballot was technically well prepared, based on a legal framework which is generally in line with international standards. We acknowledge the efforts made by the authorities of Bosnia and Herzegovina to further improve this framework. We also welcome the reform of the counting procedure and of the system of “tendered ballots”, which enabled the election administration to handle these ballots more transparently than during previous elections. Despite these positive steps, some issues remain a matter of concern. There is, first of all, the ethnic issue overshadowing the campaign and the vote. On Election Day, ethnic tensions led to violent incidents in Srebrenica and in Stolac where conflicts resulted into a physical confrontation between the Bosnian mayoral candidate and the Croat President of the Municipal Election Commission. The elections were re-scheduled and held last Sunday, on the 19th of February. They brought a victory of the seating Bosnian Croat Mayor and were assessed by domestic observers as calm and orderly, with the exception of sporadic irregularities. Secondly, there is the unsolved problem of local democracy in the City of Mostar where again no elections were held. This means that a population of some 130.000 has not been able to vote at the local level since 2008. This constitutes a serious breach of the right to self-government and is a concern for the Congress. Several parties incited citizens to vote in other municipalities outside Mostar in order to express their right to vote - which is also not conducive to the strengthening of the local vote. Let me now mention some major recommendations by the Congress which I would like to share with you. These recommendations – together with the explicative memorandum– will be discussed and adopted at the March Session. The current composition of polling station commissions and the internal communication between the three entities of the electoral administration in Bosnia and Herzegovina remain significant, from a Congress perspective. We will hear more about the efficiency of the electoral administration during the workshops this afternoon and I look forward to these discussions. The small number of members of polling station commissions in many places and the conditions of appointment and dismissal created troubles on Election Day. There was a lack of training for the new regulation about “correct counting”. This created some uncertainties and challenged the administration. In order to achieve the de-politicization of the election administration, the Congress encourages the national authorities to improve the conditions of appointment and dismissal of the members, in order to avoid trading of positions on these commissions. There is also the recurring issue of quality of voter’s lists. Despite the efforts made by the authorities, the process of updating these lists still needs to be improved. Many deceased voters remained on the lists which created differences between the number of inhabitants given by the 2013 census and the number of voters who cast a ballot. Deceased voters should be automatically removed from the lists. Moreover, there are a great number of inhabitants who are registered on the lists but are living de facto abroad. The Congress believes that an “actual link” should exist between a voter and the place in which she or he casts the ballot at local level. In line with Congress’ Recommendation 369, the electoral framework should allow only for individuals permanently residing in a specific municipality - with the very center of life in this place - to take part in local elections. Furthermore, the Congress received reports about potential fraud related to out-of- country voting. Stolen ID cards were said to be used in neighbouring countries to request mail ballots and the Central Election Commission transmitted some complaints to the Prosecutor General. We think that these risks should be taken seriously by the CEC and safeguards should be introduced for future elections. The Congress’ delegation also heard reports of vote-buying, not only through cash but also through other benefits. We ourselves observed incidents of family voting as well as dubious cases of “assisted voting” without apparent need. With regards to vote-buying, it is crucial that effective and appropriate sanctions are applied. The current lengthy investigation with regards to attempted electoral fraud undermines the effectiveness of sanctioning mechanisms. In the context of transparency of political parties and campaign financing, I should like to talk about cases of misuse of administrative resources which were mentioned to the Congress’ delegation. By improving the existing legislation on electoral fraud, effective sanctions should be introduced in order to increase trust among voters. Electoral observers know very well that misuse of administrative resources is widespread and it has somehow made its way into the established European political culture. Therefore, the Congress has already prepared a Report dedicated to this theme and will present a new Checklist at its March Session for compliance with international standards and best practices in order to prevent this form of electoral fraud. Finally, let me refer to the need to ensure a level playing field for candidates in Bosnia and Herzegovina. It is also necessary to guarantee equal access to the media during electoral campaigns. In particular, independent candidates or candidates from small parties did not receive what we would consider a fair electoral coverage. Reinforcing the legislation in favor of female participation in local democracy is important. We heard that, after the 2012 local elections, women elected as local representatives resigned during their term of office in exchange for another job and were replaced by men from their party list – which is undermining what the gender quota (currently prescribing a minimum of 40% of the underrepresented gender) wants to achieve. Ladies and gentlemen, the local elections organised on 2 October 2016 were held against the background of a challenging economic situation, continuing tensions between the central state of Bosnia and Herzegovina and Republika Srpska (I am referring to the referendum held in Srpska on the National Day just a week earlier) and a growing electoral fatigue among voters. Political allegiance is still based on ethnic identity. And there remains a division rather than a feeling of unity and responsibility for a common future. However, we from the Congress acknowledge the will of the electoral administration – and in particular of the Central Election Commission – to increase, despite the problems and hurdles, the professionalism and efficiency of the electoral management, at all levels. We are ready to assist the authorities in further improving the situation through the post-electoral dialogue offered by the Congress. I would be pleased to inform you more in detail of this dialogue in one-on-one conversations during this conference.